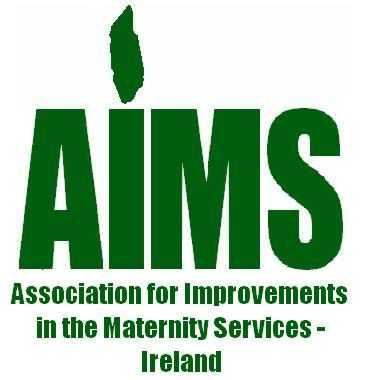 The Association for Improvements in the Maternity Services, Ireland (AIMS Ireland) is a voluntary support and advocacy group campaigning for woman-centred care and internationally recognized high quality, evidence-based practices to be implemented in the Irish maternity system. AIMS Ireland has charity status and is run solely by unpaid volunteers who are service users themselves. Our mission is to highlight and campaign for normal birth and mother-friendly birth practices which are supported by evidence-based research and international best practice. As well as our campaign work, we offer independent, confidential support and information on maternity choices and care to women and their families. AIMS Ireland offers support and information services to women (support@aimsireland.com or info@aimsireland.com) and conducts independent surveys on issues relating to maternity care. We assist in complaint letters, referrals, and fundraise in order to provide information and services, for example, host Birth Healing Workshops for women affected by birth trauma and the production of AIMS Ireland's Guide to a Healthy Birth for the West of Ireland. Over the past year, and particularly in the past month, as you'll see below, AIMS Ireland has rapidly gained strength and mandate. Though we are still a small organisation with a core of a few dedicated volunteers, AIMS Ireland's national presence in the media and at policy-making tables has mushroomed in recent months. Now more than ever we face the challenge of managing our limited resources (time and money) to best effect and hope that AIMS Ireland's increased profile will lead to greater volunteer and financial support. Please see a synopsis of AIMS Ireland's activities in the past year. In April AIMS Ireland released the results of our 2009 online survey which ran from June to December and was completed by 367 women. Postnatal care was the area rated worst, with nearly a quarter of women rating care to be "poor". Other findings were very similar to our 2007 What Matters to You survey, highlighting lack of choice in care options, geographic inequity and lack of information on available choices. The survey results were posted to Government, HSE, hospital management and media. They have gained coverage in major Irish newspapers including Sunday Business Post's Agenda Magazine ("The Mother of All Problems") and The Irish Times (in Health Supplement cover story, "Maternity Options Are Well Overdue"). The survey report is available for download on our website. In May AIMS Ireland hosted a birth healing workshop in Dublin. The all-day workshop, facilitated by psychotherapists Anne Gill and Tricia McDonnell, was fully booked with women on a waiting list. Many women in Dublin and other counties have contacted us since May with an interest in participating in upcoming workshops. We currently have enough interested women to fill another workshop in the Dublin area, highlighting a clear need for more healing support services in Ireland. AIMS Ireland is currently fundraising to meet this demand -- workshops are made possible by fundraising and personal donations. Resources permitting, we will host workshops in the West and South before the end of the year, and another in Dublin as soon as possible. Since 2008, AIMS Ireland has been lobbying the Minister for Health and the Health Services Executive (HSE) to review service user consent policy in Irish maternity services and for the creation and implementation of National Guidelines for Clinical Practice in Maternity Care. Further, these must include the publication of annual clinical reports and birth related statistics per unit/service and per individual lead clinician or practitioner therein (e.g. consultant, midwife, SECM). In the AIMS Ireland survey, The Availability of Information and Consent*, 75.6% of respondents stated that they felt that consent is an issue of concern in the Irish maternity system. Our letters and emails were frustratingly going unanswered, withering away in in-boxes. We picked up our campaign in May with renewed mandate after the release of our What Matters to You (2009) survey report. This time we asked other birth activists and consumer advocates, as well as hospital management, to join us as co-signatories on a new letter to the Health Services Executive and Minister for Health. We got a great response from academics, doulas and other activists, and though no hospital managers chose to sign, some offered support in other ways. The Minister for Health acknowledged receipt of our May 19 letter and copy of the What Matters to You (2009) report. On Tuesday July 6th, 2010 AIMS Ireland met with Dr Deirdre Mulholland, Head of Standards & Methodology, HIQA and Mr Erik Koornneef, Regional Manager, Healthcare Quality and Safety Directorate, HIQA. Discussion centred on the National Standards for Safer, Better Healthcare currently being drafted by HIQA. Read more here. Also, on Tuesday July 13th, 2010, AIMS Ireland received notification from the National Directors Office, Integrated Services Directorate, Performance and Financial Management in the HSE that our correspondence relating to informed consent in maternity care has been forwarded to Ms Anne Carrigy, National Lead Acute Hospital Services for her direct attention. We are frustrated that it has taken this long to receive an acknowledgment but look forward to progressing discussion of our issues with Anne Carrigy. AIMSI has also been promised consultation with newly appointed National Leads regarding a new Clinical Programme for Obstetric Care. A key priority of this Programme is the development of National Guidelines for Clinical Practice in Maternity Care and we look forward to contributing to this process. AIMS Ireland continues to call for the availability and publication of standardised maternity related statistics per unit and per individual care providers therein. We have been advised by HIQA and the HSE that it will also be some time before the information systems necessary to provide this data, will become available. In the interim therefore, AIMS Ireland would like to see the statistics that are already available (i.e. from maternity unit MIS systems) published and made easily accessible for women to access in order to aid transparency and assist in informed decision making. AIMS Ireland was contacted by over 50 women who had experienced questionable diagnoses (including miscarriage misdiagnosis, fetal abnormalities, placenta previa, incorrect gestational dates). AIMS Ireland also received a massive number of media requests to comment on the state of the maternity system in Ireland. Co-chair Krysia Lynch was spokesperson for AIMS Ireland on major television and radio programmes including Prime Time, RTE News, TV3 Documentary "Baby Scan Scandal", Newstalk and UTV News; AIMSI was also interviewed for pieces in the national and local newspapers and radio programmes. AIMS Ireland wrote to Dr Barry White, National Director for Quality and Clinical Care, HSE to express deep concern about reports of miscarriage misdiagnoses experienced by women across the country and HSE handling of the crisis. We further stressed our concern regarding the wider issue of best practice standardised guidelines that are currently lacking for Ireland's maternity services. Two days later, AIMS Ireland met with Dr Barry White at the HSE Head Offices to discuss these concerns. AIMSI has subsequently been asked for feedback on the Terms of Reference for the HSE internal review of cases of known miscarriage misdiagnosis and there seems to be a real commitment to include AIMS Ireland and other representative groups going forward. The issue of consent, national guidelines and the recent miscarriage misdiagnoses scandal was also raised with the Minister for Health in Dail Questions, June 22nd 2010, and again on June 29th when AIMS Ireland's calls for change (as detailed in our press release regarding the scan misdiagnoses) were specifically highlighted. We are pleased to have had the opportunity to raise important issues in the national media, with our public representatives and in the Dail, and to have at last met with HSE management regarding maternity services in Ireland but regret that it has taken yet another scandal to get to this point. Nonetheless, our focus going forward is to keep these lines of communication open so that the experiences and concerns of women, using maternity services, can be raised with Health Service Executive management on an ongoing basis. In this way we endeavour to make a significant contribution to the development of maternity services that are more woman-centred. AIMS Ireland has expressed concerns in regards to consumer/service user representation for the Miscarriage Misdiagnosis Review board and other HSE appointed boards such as the Home Birth Steering Committee. AIMS Ireland strongly feel that in the interest of equity and ensuring service user input and concerns are broadly represented, there needs to be at least two representatives of a non-professional capacity on each committee. At present, there is only one non-professional representative advocating for service users on each of these groups. In accordance with the research and guidelines created on consumer involvement in health care, two such representatives are needed to ensure a more equal representation and to assist the process of transparency. As quoted from UK National Guidelines for Maternity Services Liaison Committees - Feb 06 (in which Irish HSE appointed Consumer Groups at OLOL Drogheda and Cavan General have been based - Kinder Task force). Maternity Services need to be appropriate, acceptable and accessible to the local population. For this reason, service users need to be involved in the planning and monitoring of services. Members should recognize the positive contribution that service user members can make, strive to ensure broad representation and improve their effectiveness through provision of support and training. A minimum of 1/3 of the core membership of each committee should be user members. This makes it more likely that different perspectives are covered and service user members can support each other. It is AIMS Ireland's recommendation that a second service user representative with topical knowledge and experience should be invited to sit on these committees. On June 23rd co-chair Jene Kelly represented AIMS Ireland at the first meeting of the newly reformed Birth Matters consumer group at Our Lady of Lourdes Hospital, Drogheda. Birth Matters has been given mandate by the Director of Midwifery and Labour Ward Manager to create a new Patient Satisfaction survey to be dispersed with service users in the Northeast (Drogheda and Cavan) from 6wks post partum. AIMSI's What Matters to You (2009) Survey is one of several templates used for the discussion and design of this important project. This is a very positive step and follows on AIMS Ireland's recommendation for all Irish units to implement or improve satisfaction surveys that are given to women from at least 6 weeks post birth. In late April AIMS Ireland wrote to the Master of the Rotunda Hospital, Sam Coulter-Smith, expressing concern in relation to the death in March of Bimbo Onanuga, an Irish-Nigerian woman who was seven months pregnant and had been told days earlier that her unborn child had died. Our letter raised several points of concern, including the responsibility of maternity hospitals to take into account the specific needs of migrant women, and the need for clear and empathic communication with women and their families. While the response received was not specific to the case, AIMS Ireland was pleased to receive a swift reply from Mr. Coulter-Smith acknowledging the importance of issues raised. AIMS Ireland is aware that Amnesty International has expressed an interest in this case, in light of suggestions that race and ethnicity may have played a role in the care and treatment of Ms. Onanuga. The investigation is ongoing. Last year AIMS Ireland sent a letter to the Data Protection Commissioner expressing concerns over an HSE condition of payment to self-employed community midwives that AIMS Ireland felt breached the privacy and confidentiality of women planning a home birth. After an investigation, the DPC found there to be no basis for requiring SECMs to submit full medical midwifery notes as a condition of payment and has informed the HSE to cease the practice. AIMS Ireland Co Chair, Krysia Lynch and alternate, Susannah Sweetman, are currently the sole service user representatives of the HSE appointed Home Birth Steering Committee. AIMS Ireland's first Guide to a Healthy Birth for expecting and new parents in the West of Ireland is planned for a late October release. AIMS Ireland is working in collaboration with New York-based Choices in Childbirth, originators of the Guides to a Healthy Birth; CIC is providing the framework and design for the Irish guide and will co-publish with AIMS Ireland. This much-needed new resource aims to help women become more informed and active participants in their maternity care and to promote evidence-based birth practices and more choice in care options. It is intended as a complement to Cuidiú's national Consumer Guide to Maternity Services in Ireland which provides comprehensive information on hospital policies and practices. The guide will include a rights section, questions to ask your care provider, choices in types of care, short articles (on midwifery care, VBAC, the purpose and power of pain in labour, birth partners and breastfeeding), and listings of mother- and baby-friendly care providers in the community. These are providers and practitioners from many different disciplines who have been recommended by mothers and doulas and who have signed a statement of su port for the International MotherBaby Childbirth Initiative (IMBCI). A summary of the Initiative's main points will be included in the Guide to promote this woman-centred, humanistic model of maternity care. We hope this Guide for the West of Ireland will be a great success and that we will be able to roll out a national guide in 2012. Co Chair, Krysia Lynch continues to play an active role in the NMH's steering group focusing on breastfeeding and BFHI status. In February we launched our new and improved website at www.aimsireland.com. Many thanks to Diane McCabe, the web designer who volunteered her services to AIMSI for the project and continues to offer support when needed. - AIMSI (Krysia Lynch) chaired mid-morning session of the "Essence of Midwifery Care Conference" at the Coombe Women & Infants Univ Hospital, 2010 International Day of the Midwife. - An Bord Altranais launch of new Practice Standards for Midwives (AIMSI submitted feedback to draft standards), June 16th, document here. Also throughout the year AIMSI has been interviewed by media to comment on rising Caesarean rates (Irish Times), overcrowding (Evening Herald), lack of choice (Irish Times, Irish Independent) and lack of informed consent (Sunday World). For free, confidential support or information, you can contact us at support@aimsireland.com or info@aimsireland.com.